Last weekend I travelled to Toronto to shop! Ok, I also visited with family and friends, but I decided to go that specific weekend because the spring One of A Kind Show was on. I had heard about this show many times and even have items from past shows that people have given to me as gifts, but I had never gone myself and was dying to. The One of a Kind Show is a big event that occurs twice a year in Toronto, in both the spring and winter (right before Christmas). 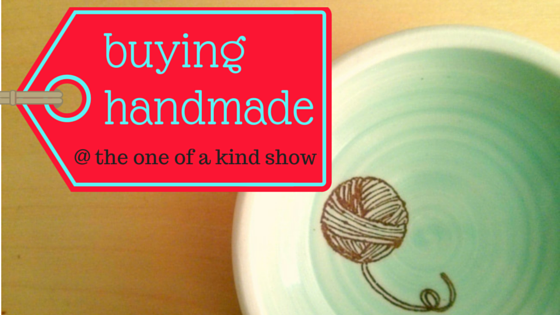 It showcases hundreds of handmade goods which you can buy right from the artist who made them. Basically, it is a huge room with rows of vendors selling their beautifully crafted handmade products – heaven! My friend and I managed to spend 6 hours there! It was my brother’s birthday coming up so I knew I needed to find something for him. In the end I bought a nifty bow tie from VIVID Clothing Toronto. I don’t have a picture of it because I already gave it to him, but you can check out their etsy shop. They had so many different patterns it was hard to decide, but I bought a bow that was reversible, so it had two different patterns in one! My brother now has to learn how to tie a bow, but that is what youtube is for. For some reason I was really into the pottery. 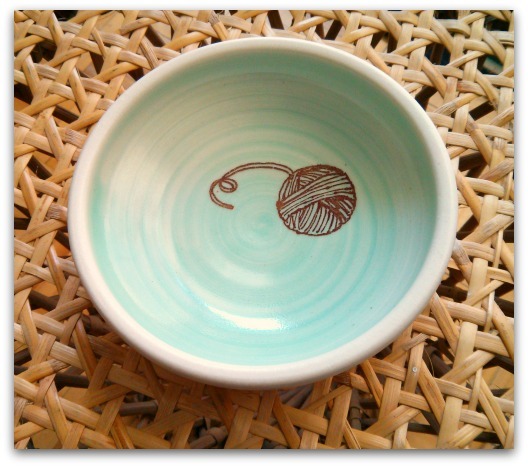 I was on the look out for a yarn bowl, and while I didn’t find one I liked, I did buy a bowl with a yarn ball inside! It was handmade by Greg Voisin – he both sculpted the bowl and hand painted the little yarn ball. It is so cute! I love the teal and cream colours, which is seen consistently throughout his work. 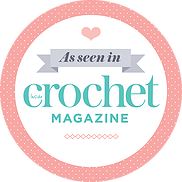 I am going to use it to put my little doodads in while I crochet, like stitch markers and needles (which I tend to place somewhere randomly and then lose…). My next piece of pottery that I purchased was a shark mug. It is made by the Montreal artist Wai-Yant Li of Creations Li and it is adorable. I had to go back to the booth several times because I wanted to buy everything and couldn’t decide. 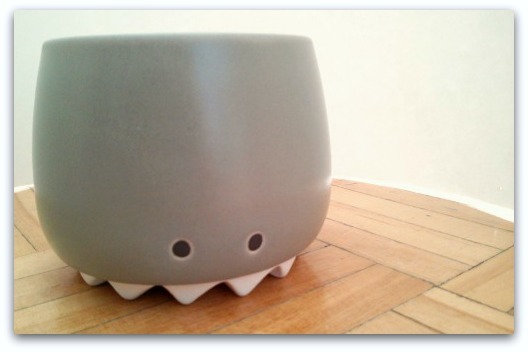 Wai-Yant also makes items that look like blow fish, squid and monsters, all with a cute face. 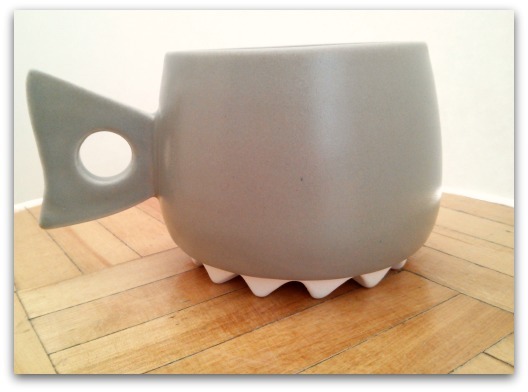 My mug is called ‘Chomps Shark Mug’ and you can find it on the Creations Li website. Can’t wait to make some tea in this guy. Lastly, I bought an embroidery kit by kiriki press to make my very own little stuffed raccoon. I sometimes embroider noses and eyes on my crochet amigurumi, but my technique, if you can call it that, is not the greatest. I am hoping this kit will teach me some mad embroidery skills that I can then transfer to my amigurumi – plus I get a super cute raccoon! 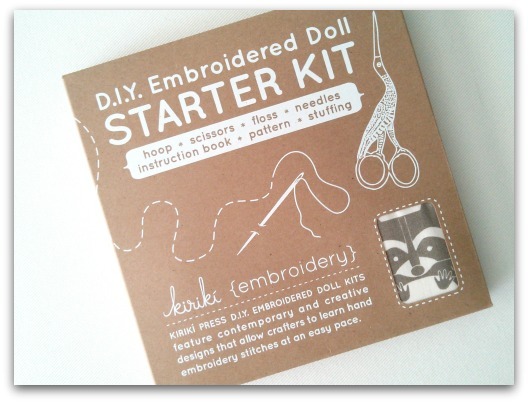 The kit is complete with a hoop, crane scissors (which I love! ), needles, an instruction book of stitches, the raccoon pattern and fabric, and stuffing. I will likely write another post exclusively on this kit once I get around to making it, so stay tuned. All in all it was a fun weekend with shopping, friends and family, plus I got to see all those amazing artists selling their handmade goods – very inspirational!